Rescuer Shelters Please Check In! We need to update our nationwide rescue data base. 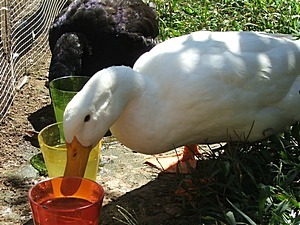 If you accept domestic ducks or geese into your program and want us to contact you when there are animals in need in your area, or adopters in your area, please send us your contact information. Even if you think we already have your city/state & contact information, please resend it to us. This is for Majestic's use only. Information will not be shared without your prior authorization. Please email your information to Director. Tutter tests the integrity of the fence! When "fowl play" rears its ugly head, three brave youngsters risk everything to save their best pal: a web-footed wonder from Down Under. 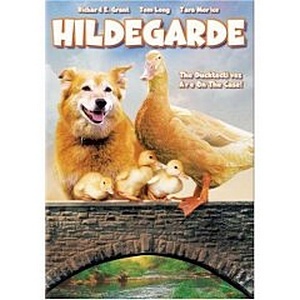 Christopher, Jeremy and Isabel are overjoyed to discover that their beloved pet duck will soon become a mother, but when she mysteriously disappears, leaving a nest full of unprotected eggs, all clues point to Wolf and Tony, a pair of scoundrels whose traveling nature show is a cover for their illegal bird-napping/smuggling operation. Now it's up to the kids to rescue their "ab-duck-ted" friend and put a stop to the crooks' dastardly plans! Looking back, it is hard to believe how far we�ve come in such a short period of time. 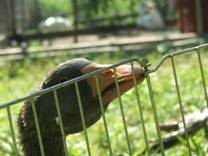 Since our inception in the fall of 2004 we have welcomed nearly 100 birds into our sanctuary. In addition to the waterfowl we�ve directly assisted here, we have helped many more that were outside of our reach by providing guidance and direction to their rescuers. We�d like to thank each and every one of you who have rolled up your sleeves, put on your muck boots and learned how to catch a duck (or goose!) abandoned in your own area. It�s not always easy, but as you now know, it is very rewarding to save a life. In the past year we have fielded nearly a thousand questions ranging from basic care to serious medical emergencies. We have distributed a monthly informational newsletter to flock owners around the world. We pride ourselves on teaching proper care of domestic waterfowl, proving an invaluable resource to pet owners. We have added a new pen to our grounds and have laid out plans for two more. We have successfully transformed these predator proof pens into cozy habitats. Small trees now provide shade in every pen. Aquatic plants and fish add an element of nature and serenity. Those few pens without running water are cooled by a camouflaged misting system that runs on a steady timer. Electricity has been installed, reaching out to every pen, enabling us to remove unsightly extension cords from our pens while keeping pumps running in summer and drinking water warm during winter. We have secured grants and matched donations from companies like Aetna, UTC, Pfizer and Verizon, and we would like to thank those of you at these companies who have donated and helped us participate in these programs. We have received our first grant thanks to the thoughtfulness of Dr. Poster--THANK YOU! We also have a new volunteer onboard who is helping us apply for grants to obtain a small excavator, which will greatly increase our expansion efforts. We'd like to extend a very special thank you to Dr. Melgey & his staff at All Friends Animal Hospital in Norwich CT for their continued generosity and support. 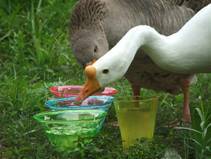 They have helped us make a difference in the lives of so many ducks and geese. This year we also received a kayak donation, which has already enabled us to rescue abandoned waterfowl and bring them safely into our sanctuary. The year ahead is a promising one, for us and for the waterfowl who need us, and we have all of you to thank for that. An abscess can be difficult to spot on a duck or goose as they tend to be hidden beneath feathers. Behavioral changes are an indicator to pick up your bird and give them a precursory medical exam. Have a look and feel around to make sure all is as it should be. An abscess may become noticeable as it grows, making an area of pink skin suddenly viewable. They can get very large, sometimes as large as an egg�and they can even feel as hard as an egg. 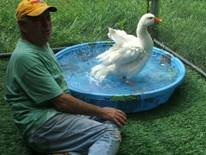 If your duck or goose has a large swollen area you must bring it to the vet immediately for draining. Vets will often use a syringe to drain out the fluids out and prescribe a few weeks of antibiotics (22 mg Baytril, once daily) until it is completely healed and gone. Multiple visits may be necessary to remove fluids. The liquid drawn from the area should be clear to slightly yellow. If the liquid is yellow, thick or creamy in consistency it is a warning sign of infection. A drain may need to be inserted, but this is normally reserved as a last resort (or in the case of serious infection) since ducks and geese are meticulous preeners and may pluck out the drain tube causing further problems. An abscess can be caused by a scrape or bite that has become infected. You will want your vet to identify the cause, if possible, so you can properly address the issue. Either something in your pen is poking your duck and putting them at risk, or something is nipping at your feathered friend. If an abscess breaks open, emergency vet care will be needed. If it is after hours, do not wait until morning to call your vet. The area will need to be flushed and drained, antibiotics will be needed and stitching will be required. In some cases, a drain tube may need to be stitched into the area for a short period and then removed later. 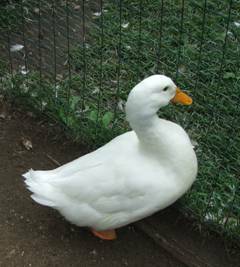 If an abscess bursts, your bird will need to be placed in a very clean pen out of reach of the remaining flock�to avoid any of the others causing further damage to the area. Crocodile Stanley is a wonderful boy in need of a new home. He has been with us for a long time. Croc has one eye that was poked in before he was rescued and brought to our sanctuary. It only requires an occasional application of antibiotic ointment, which he is very accustomed to. Croc is a strong alpha drake and would love to go to a home with a few nice hens. He does well with smaller drakes (like Riddles & Joker) who respect his authority without challenge. Crocodile is shy, but allows limited petting from the people he is used to and who care for him everyday, provided you stay in his line of vision. If you are a loving family and have a predator proof pen, please consider adopting Crocodile Stanley! Click here to fill out our online adoption application. If you can�t adopt this handsome boy, please consider sponsoring him by visiting our sponsor page.